Within the framework of a collaboration started in 2004, Icma San Giorgio has installed at the laboratory of Polymer Engineering at the “Giulio Natta” Department of Chemistry, Materials and Chemical Engineering of the Milan Polytechnic (www.chem.polimi.it/polyenglab) a complete compounding laboratory line equipped with an MCM HT 25 co-rotating twin screw extruder. The extruder belongs to the smaller size of Icma’s high torque MCM family and it has been designed to process a wide range of polymeric materials in the research and development activities carried out by the Polytechnic and ICMA itself in particular in the field of preparation of micro- and nano-composites loaded with particles or short fibres. The exploitation of these materials requires a special design, in terms of both mechanical configuration of the extruder and chemical formulation in order to obtain an optimized microstructure at the end of the transformation process. To this scope, it is essential to determine the proper correlation between composition, process variables, micro-and nano-structure and final properties of the composite. The machine will also be available to the students of the degree course in materials engineering and nanotechnology, to conduct exercises and thesis. 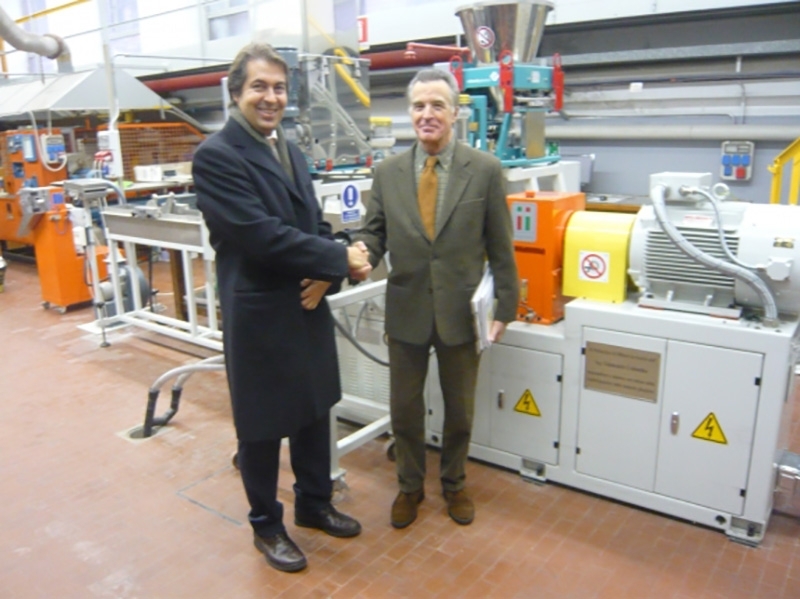 Giorgio Colombo, Managing Director of Icma San Giorgio, said: "This is a particularly significant moment for our company that consolidates a strategic alliance with a department of great tradition and prestige in the world specifically in the field of polymeric materials. It is also a reason of pride to see the Italian technology, recognized as among the most advanced in the world, placed at the service of an innovative and modern scientific centre as the Polytechnic of Milan "
The group of Polymer Engineering of the Polytechnic of Milan, led by Andrea Pavan, is internationally known for research on the properties of polymeric materials in advanced engineering applications. Pavan himself said: "The collaboration with Icma San Giorgio is one of the finest examples of effective and efficient interaction between academia and industry both in applied research aimed at practical themes and in training of young engineers.